Lorenzo Ballesteros Martinez, 92, of Carlsbad, passed on to be with the Lord peacefully September 3, 2018 at his home surrounded by his loved ones. Visitation will be 5:00 PM – 6:00 PM, Tuesday, September 11, 2018 at San Jose Catholic Church. A Vigil is scheduled for 6:00 PM, Tuesday, September 11, 2018 at San Jose Catholic Church. Mass of Christian Burial is scheduled for 10:00 AM, Wednesday, September 12, 2018 at San Jose Catholic Church with Fr. Martin Cordero officiating. Interment will follow in Carlsbad Cemetery, Carlsbad, New Mexico. Carlsbad Veterans Honor Guard will provide military honors. Denton-Wood Funeral Home is in charge of the arrangements. Lorenzo was born July 11, 1926 in Tornillo, TX to Augustina Ballesteros, and was raised by his uncle and aunt Victoriano and Paula Ballesteros. Lorenzo was enlisted into the United States Army on November 27, 1945, and served as an Airborne Paratrooper during World War II. After being honorably discharged, he married the love of his life, Dominga Ramirez, in June of 1947. He worked as a farm hand for several years and then went on to work for the Gibson brothers at the Coca Cola Bottling Company for 22 years, where his co-workers affectionately named him “Pancho.” He eventually retired from the City of Carlsbad, where he worked as a street sweeper. Throughout the years he enjoyed coaching his son in little league baseball and his daughter in softball. A devoted member of San Jose Catholic Church, Lorenzo and his wife were integral in starting the Guadalupano Spanish Choir. He spent much of his time composing and writing music for the group, and loved to sing and play the sticks at mass each Sunday. One of his proudest achievements was when the group was selected to perform at the San Fernando Cathedral in San Antonio. He was a Cursillista, and a member of San Jose Holy Name Society, the Knights of Columbus, and the American Legion. Lorenzo’s favorite hobbies included fishing, where he was known as one of the best fishermen in town; and playing cards and dominoes with friends and family, who had to keep a close eye on his every move. He was a die-hard Dallas Cowboys fan, and even up to his last days, he loved to drink his Bud Lights. He was preceded in death by his mother, twin brother who passed at birth, brother Juan Merjil, sister Tomasa Ballesteros, daughter Magdalena Martinez, and sons Frankie & Daniel Martinez. 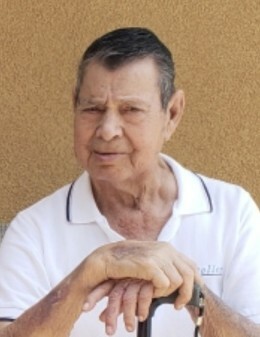 He is survived by his wife of 71 years, Dominga R. Martinez of Carlsbad; daughters Alicia Madrid of Carlsbad and Teresa Lopez and husband Alvino of Carlsbad; sons Eddie Martinez of Lubbock, TX and Jorge Martinez of Carlsbad; sisters Maria Louisa Pompa of California and Concha Rocha and husband Clemente of Sacramento, CA; 9 grandchildren; 4 great grandchildren; and numerous nephews, nieces, cousins and friends. Pallbearers are Eddie Martinez, Jorge Martinez, Michael John Madrid, Joe Luis Martinez, Ryan Echavarria, Paul Merjil, Joel Hernandez and Manuel Sillas. Honorary pallbearers are Stephen Madrid, Ashley Echavarria, Mariah Martinez, Alyssa Martinez, Trent Echavarria, Ryan Echavarria Jr., and Isaac Griffin.